We, Sy, Huyen and Luna our daughter who is running our lovely homestay based in the middle of the rice field at Cu Lac village 1 km from Phong Nha main town. 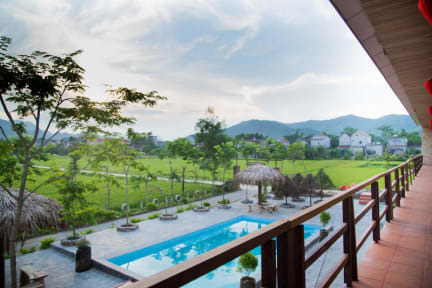 Our homestay is a great base to explore the Phong Nha-Ke Bang national park and its caves as well as meet the local farmers. Our homestay offers 8 private bungalows with a mountain view of the National Park. A great spot to watch the sunset and rice field. We also provide the common area with hammocks, chairs, and tables for chilling out. Come, stay with us and share your experience with our family! The guess is free picked up 5 km from Sy's Homestay and if it's available, they will early check in with a private room. Guess will on time to check in follow policy if it's some guess will be sleeping in Dorm Room.